On the Saturdays and Sundays of Great Lent, the Scripture readings are normally from the Epistle to the Hebrews and from the Gospel according to St. Mark. 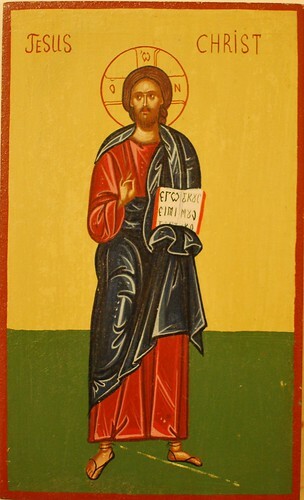 In both cases the readings are very catechetical, focusing on answering the question, “Who is Jesus?” On the 2nd Sunday of Great Lent the Epistle is Hebrews 1:10-2:3, which is part of the opening argument of Hebrews that Jesus is not an angel, not even the greatest of angels, but rather He is God’s own Son. And: “You, LORD, in the beginning laid the foundation of the earth, And the heavens are the work of Your hands. They will perish, but You remain; And they will all grow old like a garment; Like a cloak You will fold them up, And they will be changed. But You are the same, And Your years will not fail.” But to which of the angels has He ever said: “Sit at My right hand, Till I make Your enemies Your footstool”? Are they not all ministering spirits sent forth to minister for those who will inherit salvation? Therefore we must give the more earnest heed to the things we have heard, lest we drift away. For if the word spoken through angels proved steadfast, and every transgression and disobedience received a just reward, how shall we escape if we neglect so great a salvation, which at the first began to be spoken by the Lord, and was confirmed to us by those who heard Him. In addition to your post I was wondering, Many Christians do not yet realize the pivotal role played by the Apostle Paul in Christianity. Until Paul began to teach and preach at Antioch, disciples were not called Christians. Christianity began at the appearing of Paul. He is the Apostle who by direct revelation from the glorified Christ laid down every single bit and piece of Christian New Testament doctrine and practice. Christendom needs to understand that Paul’s doctrine is the fountain of joy and life to all men. His fourteen epistles hold the monopoly of Christian doctrine and practice. In this light the whole counsel of God is to be interpreted in the light of Paul’s Gospel. Thus while Christ is the cornerstone foundation of Christianity, Paul is the master builder (chief architect) and founder of Christianity, which is Christ, nothing added, nothing needed, just Christ. The grace and apostleship to build the Church can only proceed from the full discernment and understanding of the revelation of Jesus Christ given to Paul.